On April 4, 1967, B.C. Gamble set off a dynamite charge that launched the building of Gamble-Skogmo, Inc.’s $2 million home office building at Highway 12 and Vernon Ave. (now Park Place Blvd.) Over 200 people were in attendance at the groundbreaking ceremony, including Minneapolis mayor Arthur Naftalin, Golden Valley mayor Carl Nadasdy, St. Louis Park mayor Leonoard Thiel. The 7 1/2 acre-site had been Evanoff’s truck gardens. The builder was announced in 1967 to be Naugle-Leck, although it was later noted that the builder was E.R. Conry Construction Co. Employee Goerge C. (Bud) Bohlig was given the job of interior decoration, and he strove to chose decor for each executive office that was “compatible with the personality of the person using the office,” according to a promotional brochure. The address of the building was 5100 Gamble Drive, although it mostly fronted Highway 100. It was made of 180,000 bricks and 248 tons of stone. The building had 200,000 sq. feet of office space. The Open House was January 7, 1968, with Governor Orville Freeman in attendance. Floor of antique period oak in a Fountainbleau pattern from Kentucky. Solid brass chandeliers imported from Italy – so heavy that steel beams had to be installed to support them. An article from April 1967 indicated that the building would be the International Headquarters, consisting of about 4,000 stores in 37 states and all the provinces of Canada. The building was to replace the firm’s previous headquarters at 8th Street and Hennepin Ave. in downtown Minneapolis. The firm employed approximately 20,000 people. REGIONAL WAREHOUSE: 5445 WAYZATA BLVD. This facility was built to serve 550 retail stores in the four-state area. In 1967 it had been recently expanded to 380,000 square feet on its 14 acres of office and warehouse space. The warehouse held appliances, hardware, sporting goods, farm implements, automotive parts, and furniture. Wayne Musgrave was the warehouse manager, and Mahlon Rotzien was the regional manager. There were 200 employees in the warehouse. Early computers handled 65,000 “flexipay” accounts, invoice receipts for three warehouses, and tracked 25,000 items. A company spokesman said that the biggest job the computer does is to automatically read and analyze cash register tapes for the Tempo stores. Gamble and Phil Skogmo, boyhood friends from Arthur, North Dakota, came to Minnesota separately in 1920. They opened a car dealership in Fergus Falls, but found that the auto parts business was the most lucrative. They opened the first Gamble-Skogmo Auto Supply Store in 1925 in St. Cloud. Their stores went from selling only auto supplies to housewares, hardware, appliances, etc. From 1925 to 1928 they were headquartered in Fergus Falls. In 1928 they had 55 stores and they moved their headquarters to Minneapolis, most notably at 700 N. Washington for 18 years, and 15 North 8th Street (at Hennepin) for 22 years. Philip Skogmo died in 1949. A 1964 article says that Carl C. Raugust was president. The company consisted of 456 company-owned stores, 40 low-margin retail units (also company-owned), and 2,404 authorized dealers for a total of 2,536 stores. At its peak the company had almost 4,200 stores in 38 states, including Gambles Department Stores, Red Owl, and Snyder Drug Stores. In 1977 Bert Gamble retired. The company was sold to Wickes in 1980. Wickes went bankrupt in 1982. The company that was Gamble-Skogmo was sold off in pieces. Many long-time employees lost their retirement funds as a result. Despite a class-action suit, thousands of hard-earned dollars just disappeared. 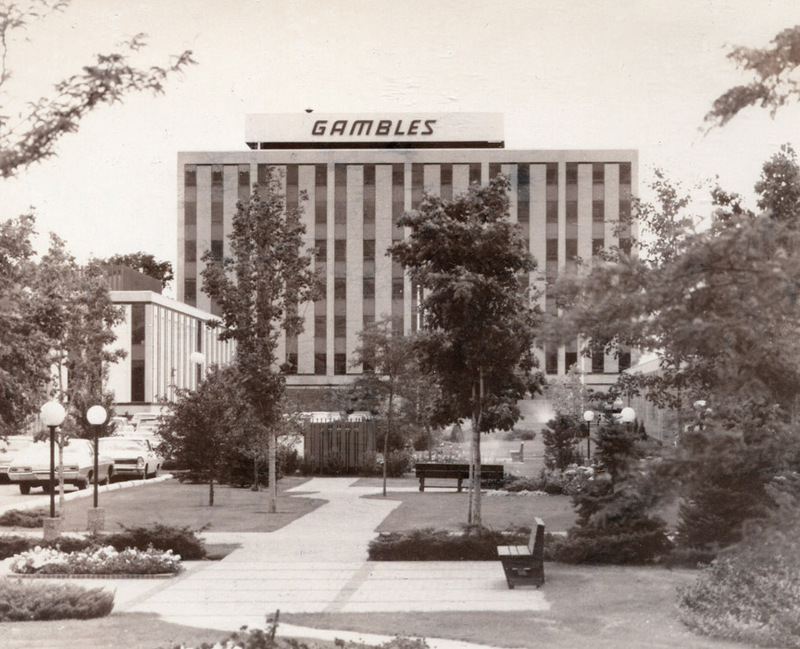 There was a Gamble Museum in the headquarters building in St. Louis Park that was moved to the lobby of Walker Methodist Health Center at 3737 Bryant Avenue South in Minneapolis. The museum contains a wide variety of merchandise that was sold in the early Gambles Hardware Stores, along with awards and memorabilia highlighting Mr. Gamble’s merchandising accomplishments and community philanthropic participation. In later years, the building at 5100 Gamble Drive houses a medical and dental center for Group Health. Any additions or corrections to this information are appreciated; please contact us.